In true bowhunter’s fashion, we decided to have a little fun with our gender reveal and use our bows. We placed two balloons in our parent’s garage with a backstop target, one for me to shoot and one for Nick (note: there is only ONE baby though :). At a 3-2-1 countdown, we released our arrows at the paint-filled balloons for the big reveal. I created a canvas piece for the paint to splash onto and will be putting it up in the baby’s room. A “before” photo of the canvas. I painted it a blue-ish gray knowing that either a darker blue or a pink would splash onto it. 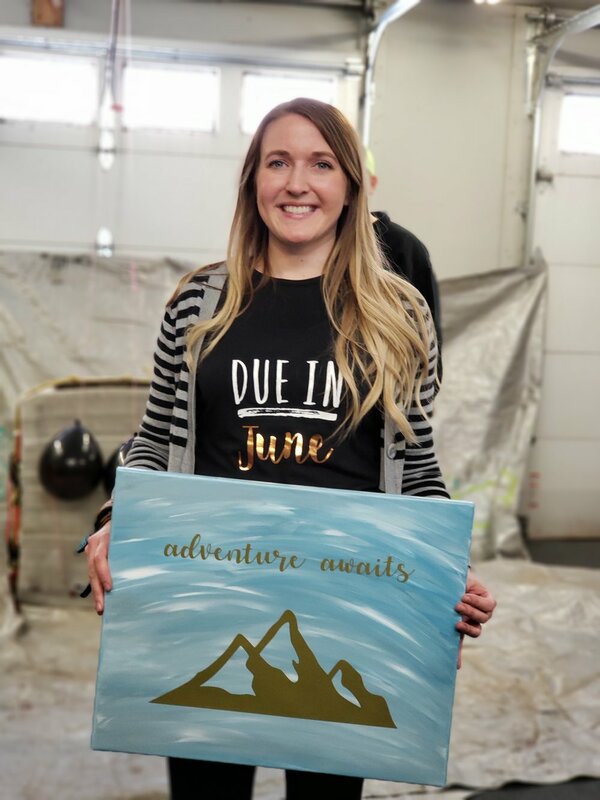 I had my sister-in-law use her Cricut to cut out the stickers of “adventure awaits” and the mountains. Let me just start by saying that Nick and I did not have a preference when it comes to our baby’s gender; we honestly just want a healthy baby. That said, most of our family guessed boy, with votes tallied at 18 for boy and 8 for girl. My guess, ever since the first ultrasound around 10 weeks, was girl. My reason? I felt like baby J was petite. Although, I am a first-time mom so I really was just guessing. However, I also have two sisters and one brother and both of my sisters each have two girls. Girls just seem to be the trend around my side of the family. On Nick’s side, there are more boys. The first-borns have almost exclusively been boys. But hey, there is always a 50/50 chance, right? We invited our immediate family over for brunch and to witness the big reveal. It was such a memorable day! We had to shoot the balloons in our garage at about 8 yards because we live in the tundra, AKA northern Minnesota, where temps were around -15. Is the anticipation getting to you yet?! Newer PostHunting Shame? I'm over it. You should be, too.